Stories are my passion, in writing, artwork, or film. I love analyzing and creating, and I love meaning in the things I do or the tales I tell. I got into this whole Russia thing some months ago when I was investigating my family’s Croatian history. My interest grew from just the Croats to the Balkans and finally the entire Slavic realm. So I started reading Russian history. I started learning Cyrillic and the Russian language (да!). I watched Sergei Eisenstein’s iconic 1944 epic Ivan the Terrible. I fell in love with the Russian rock band Lyube (listen to my fave Russian tunes here 🎶). I spazzed over the World Cup in Moscow (and rooted for Croatia, Russia, and England. GO VATRENI!). Also, I fell head over heels for Ivan Braginski (but really, how could you not?). I poked in a lot of Russian books in my time under the Slavic spell. I fairly raided my library for good ones (that didn’t mention Putin by the title’s third word). I wanted to hear about Russia–not the politics (necessarily), not the government, not the intrigue, not the spying. Not Putin. I wanted Russia. Who are the people, what are they like? What is the nation looking for, where is it going? What is it about the Russian soul, about its love for pain and poetry? I read portions of the incredibly fascinating Russia in Search of Itself, and then landed on David Greene’s Midnight in Siberia. This book had it all–the humanity of Russia, the vulnerability of Russia, the toughness and strength of Russia, the pensiveness and the laughter, the confusion and the nostalgia. But most importantly, it has the everyday and the ordinary, the machinations of life across a nation that has so much to give and yet so few ways to give it. Greene travels across the Siberian expanse in search of that aforementioned Russian soul, and comes away with an experience that is not simplified, not glorified, not vilified. The people aren’t after Western-style democracy; the 1990s failed experiment put an end to that. They’re often nostalgic for Soviet times when education and health were more or less guarantees (even if the payoff was personal freedoms). They don’t like the uncertainty of their current lives; they are sometimes afraid, and often find themselves enduring, rather than living–as we in the US define living, anyhow, in our mostly quite privileged lives, privileged meaning you can start a business, abide by the rules, and expect the government to be predictably fair with you; you can go to medical school and not fear that you will be drafted for obligatory duty; you can get a train ticket without a maniacal hassle of unpredictable schedules, pricing, and seating. In Russia, things are different. At times you realize their system–of justice, of finance, of politics–is so deeply flawed, and yet there’s a beauty in the endurance and doggedness of the people themselves, a people that has learned to live with change and troubles from the Siberian steppe to the ever-shifting and ever-distant governmental heads. To me, that is Russia. Я влюблен в тебя Россия влюблен––I’m in love with you, Russia, in love. I know, I know… I’m a bit late for National Siblings Day but here I am. But I’ve got a sibling, a sister I love dearly, so I dare say I qualify to poke my head out fashionably late on a day like today. What I want to reflect on now is how much my sister means to me and how much fandom and story has connected us even more than we were already. We’d always been close, my sister and me. We’d always loved stories, our literature class was one of our favorites in school. But the bright splendor of discovering a film and seeing not just you, but you and the person that means the most to you, in it just blew our minds and in many ways transformed us. Falling in love with our fictional counterparts (in this case, Hiccup and Toothless from How to Train Your Dragon) and seeing in that relationship a solid trueness forged in us a deeper bond than simply sharing a similar interest. The love we saw on screen elevated the love we felt for one another and in so many ways we grew into the love we saw as so utterly beautiful. Then I got into fandom (in this case, through tumblr) and realized these on-screen relationships were the major reason so many people attached themselves to these stories. Many times I saw people wishing they had a loyal, selfless friend like John Watson is to Sherlock Holmes. Or a dogged true love like Peeta is to Katniss. Or share a bond like the Winchester brothers on Supernatural. So many times I see lonely people on the web who look up to these stories because they want those kinds of people in their lives. I am, for one, lucky to have that dream fulfilled in my sister. But I am also grateful that these stories exist for the people, the kids, the lonely outcasts, the shy dreamers, who are still alone and who still have hope. These are the kinds of stories that tell them love is real, friendship is possible, and show them that despite the odds, despite what kind of person you are, there is always someone who can and will love you and accept you for who you are. Stories might be fictional, but the love and hope they express is very much real. And I have seen first hand how important the relationships portrayed can be. Capturing that Childlike Star Wars Magic Again in Beware the Power of the Dark Side! This book surprised me in so many ways. Its tone, its insight, its author’s note (this man loves Star Wars so much it makes my eyes misty I swear). He’s got humility, and you suddenly realize how important that is for a writer of licensed material to have. This is a writer I can trust to handle the characters and people close to my heart. This is unquestionably my favorite book to come out of the rebooted canon of Star Wars so far. Why? Tom Angleberger loves Star Wars with a child’s purity and passion, but he writes with an ironic insight that captures powerful, subtle layers of characterization and thematic importance, leaving no character untouched by an aside for motivations. He is a true fan and with that love he gives everyone dignity, credit, and depth. On top of that there’s humor (the footnotes are golden), his prose sparkling with all the wide-eyed horror, cheek, and excitement only a child could experience, yet with the knowing thoughtfulness of an adult. There are lines in this book I wish I could save forever. Angleberger has a talent for finding seemingly unconnected events and pointing out the thoughtful irony in them. All said with an absolute minimum of words and a joyous playfulness. It reminds me of what effective characterization can be achieved through the quality of brevity in style. Return of the Jedi: Beware the Power of the Dark Side! is serious, hilarious, full of heart, pure joy, and thoughtful reflection. I think its magic comes from how much Angleberger loves the material and strove to bring his childhood love to life again, with the wide-eyed wonder that makes the same story new again. Ever since stepping into Star Wars, I’ve been dabbling in the (old and new) Expanded Universe books and comics. There’s so much to read about, so many people who truly love Star Wars who’ve written amazing things in it, and right now I’m almost tempted to make a series on my Adventures in Star Wars. Anyway, so far Timothy Zahn is the gold standard for SW novels. Here’s why. I don’t even know where to start with my outright love for this book and Zahn’s writing. So many licensed books (and sequels) get things wrong. They’re out-of-character, uninventive, and a disrespect to the original story that inspired them. But this book gets it right. It develops familiar characters with dignity and gravity, and invents new, three-dimensional characters that carry a vast presence on the page. We see Luke Skywalker with the same quiet, serious conviction that defined his arc in Return of the Jedi, but facing new fears as he questions his ability to be the Jedi his masters were, with no one to teach him but his own instincts and grounded morality. We see Han Solo, still as wry and witty as ever, but with the added sense of responsibility for not only his new wife but his unborn children. Leia holds her own, under attack by mysterious assassins, while learning the ways of the Force and her new lightsaber (oh how I wish she would have still become a Jedi in the Disney canon…). Characters are not taken for granted and are written with introspective awareness of their own journeys and their own beliefs. This is everything a Star Wars book needs to be to do justice to the incredible characters that gave life to the original. I am in love. Zahn’s brilliant grasp on understanding a character’s core spills over into his new creations, Mara Jade, Talon Karrde, Grand Admiral Thrawn, and the dark Jedi Joruus C’baoth. Foundational characters in the (now uncrowned) Star Wars Expanded Universe. And no wonder. None of them act out of simple hatred or rage, despite playing the “bad guys” of the story. He writes them with a surety of beliefs and conviction, clear and purposed goals, and complex motivations. They are people, with the nuances that come with that distinction. Zahn is effortless with the concepts that make this story as a whole so vastly well-rounded. He’s got military strategy down like an expert — Thrawn is a real commander, the kind that could lead a successful army in real life… the guy’s a genius tactician, psychologist, and a great leader. The dogfights and battles spark of tangible reality and down-to-earth strategics, with physics a very real presence in so many tactics employed by Luke and others. Zahn’s got economy, he’s got politics, he’s got a stunning imagination for fantastic, but scientifically-grounded world-building (such as Lando’s walking city). The details here aren’t arbitrary and we don’t get any lame references to nerf nuggets, hit singles, and throw-in-a-holo-prefix to create a world (sorry Heir to the Jedi is still my standard for a bad Star Wars novel). Instead, there’s logistics to Zahn’s worlds, unassuming uniqueness in his invention of terms and customs. And then there’s the plot and humor. Zahn’s sense of comedy is so low-key and situational. Somehow he makes grand tense scenes like the ones between Thrawn and C’baoth both full of bone fide suspense and dignity, and equal parts squabbling crack. It’s utterly brilliant. The plot doesn’t try to reach beyond itself or be too mind-blowing, but is based on a sense of logistics with the new Republic and the scraps of the old Empire. Han is out trying to recruit smugglers to aid the Republic shipping and economics. Thrawn is recruiting the dark Jedi C’baoth to mentally unify the fleet into efficiency (while planning for his big attack). Elements fall together with insane (and sometimes humorous) genius, and build up with suspense and mystery. It’s small scale enough to feel like the little people that populate Star Wars, epic enough to feel like the largest ILM battle sequences. The old Expanded Universe might have been scrapped, but to me this stuff is canon. It captures more of the heart and soul of the characters and the story of Star Wars than so many other books, and I only hope they use the template of deft characterization here to define what’s coming in the EU. And that is what I found within this book. His is an elegant way of mind, the way he navigates the humor and philosophical ironies of life (such as the book-length banter with Spock on whether the two of them are one or distinct). His is an honest, approachable voice, and many times I have felt like cradling into his warm prose. He talks about his philosophy, how he honed the character Spock, how he dealt with fans, and how he helped create the stories of the Star Trek films (always fun to read behind-the-scenes goodies – the fun and the challenges). I loved hearing about his relationship with William Shatner, both feud and friendship. His passion to keeping Spock’s dignity and character as pure as he could throughout the run of the franchise speaks a lot about his character and the maturity he has. He is respectful, understanding, dispassionate and yet full of emotion and love. This book carries you through his mind, his soul, and it is effortless, and sometimes I wondered how deep I was actually getting to his heart when I realized, this calmness, this serenity, and the gentleness of his way of looking at life… that’s his heart and I was there all along. I respect and adore this man so much. He has been a comfort, a haven, and an inspiration. He hoped that, sometimes, people would think of him when they think of Spock. Well I do. And I will continue to do so, because the man is truly as inspiring as the character is compelling. 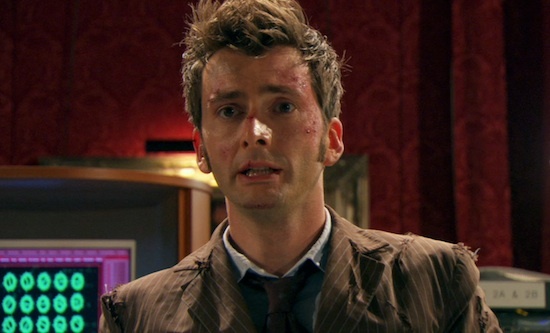 Ten was at first ruder than the self he became later, part of the hangover from his ninth regeneration. When he chided Rose for not trusting him post-regeneration, he remarked: “Is that what I am, rude and not ginger?” (“Christmas Invasion”). It’s his Nine-self that was rude, his Ten-self that was beginning to see that that kind of attitude wasn’t the most ideal. Nine was quite rude and often insulting of humanity, and if they acted stupid he wasn’t afraid to call them out, and that attitude itself was a result of the bitterness inside of him due to the Time War. Ten shared the cocky streak of Nine, but it was tempered a lot by his own renewed amazement with life around him, and the humanizing influence of his companions, as well as by the continual losses he faced throughout his regeneration. Ten was more carefree than Nine, and compared to his later self, Ten was sometimes less aware of the importance of people around him (such as Mickey Smith, who had never measured up to his respect when he first met him in his ninth regeneration). The Doctor with Rose was a tad less mature and a bit less responsible, and could afford to have fun. He was loose, spontaneous, innocent, wide-eyed, and in some ways, naive about the human consequences of his life. 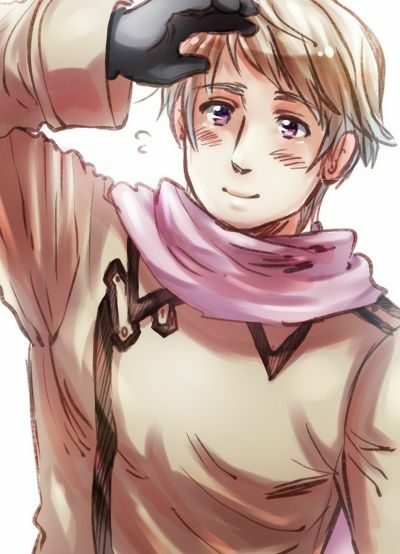 He’s almost willfully put off thinking about them, such as his relationship with Rose, taking in the joy of it without thinking about her home life. That lack of foresight comes back to bite him in “Doomsday,” when he loses Rose permanently. The Doctor knows he can’t have a companion with him forever. “School Reunion” offers chilling insight into the dark truth he believes about his life. When confronted with his lifestyle of leaving companions behind in the past, he painfully states the truth to Rose: “You can spend the rest of your life with me, but I can’t spend the rest of mine with you.” He doesn’t want to watch the people he loves wither and die, and it’s that horror he avoids when he leaves people behind. It’s the fact of his existence, and it’s a truth he is pained to admit, but doesn’t want to think about. At one point (“Army of Ghosts”) he asks Rose how long she’d stay with him, just because he wants to hear her say, “Forever.” He wants to believe the fantasy, because he liked it, and it didn’t hurt. But at “Doomsday” he realizes he’s grown so close to Rose that she’d choose him over her own family and her own life at home on earth. And that, as beautiful as it is, as much as the Doctor does love to see that she loves him enough to do that, that kind of sacrifice is something the Doctor hates for someone to do, because now he realized that in just having fun, he created something irreversible in Rose. He created a love that is fierce and loyal, a love that chains her to him and prevents her from having the happy life that he wished he could have, a happy life that she deserves, the life of getting up at 2 am, picking up a taxi, going to work (paraphrasing Nine), a life day after day, “the one adventure I could never have” (“Doomsday”). 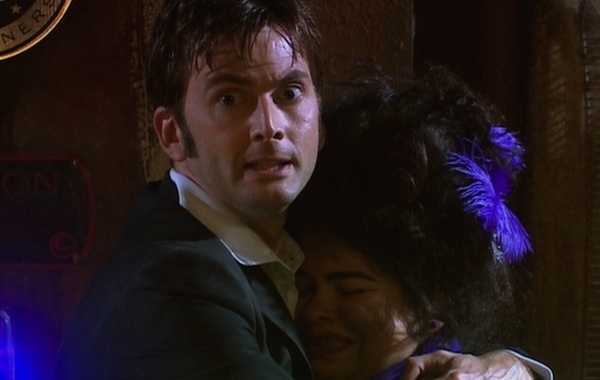 He knows how much Rose needs her family and her way of life, based on a revelatory conversation in “Impossible Planet.” It’s that very humble, everyday, stupid life the Tenth Doctor longs for himself, so to see someone give that up for him… is horrific. Because at his heart, the Tenth Doctor doesn’t believe he’s worth that kind of sacrifice. At “Doomsday,” the Tenth Doctor realized he took her life, and taking life is the Tenth Doctor’s greatest guilt. He lives in the shadow of Rose for the rest of his incarnation, and with Martha and Donna, he tries to believe she’s having a happy life, because if she isn’t, then his own moral conscience would condemn him forever. The Doctor loves Rose for many reasons, and I want to detour quickly to describe why and how, because no picture of the Tenth Doctor is complete without Rose. She and him share a fundamental thrill of adventure and danger, cheeky smarts, and a childlike sense of joy that sums him up perfectly. She wanted to be like the Doctor (as her mum, Jackie, wryly pointed out to her in “Army of Ghosts”), and the Doctor relished in the fact that he could trust her (letting her man the TARDIS in “Army of Ghosts”). The big point of “Satan Pit” was to show how Rose, when the Doctor was trapped, took the Doctor’s place in upholding virtue and leading a team. The Doctor, meanwhile, trusted Rose’s intelligence and abilities enough that he believed she could work herself out of the danger he was forced to put her in, in order to save the world. 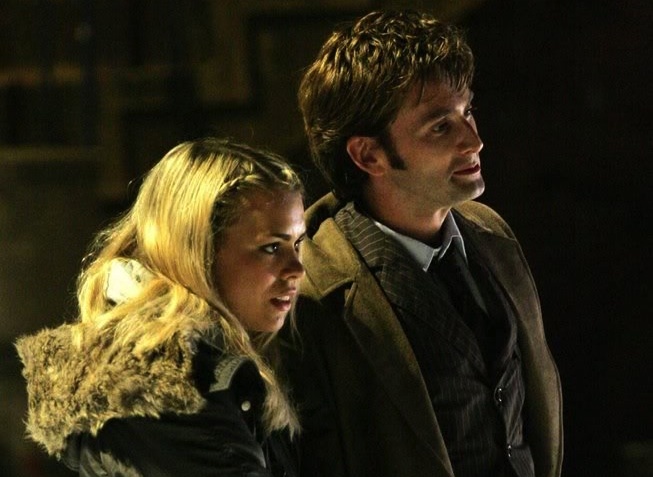 Rose changed the Doctor’s worldview on many things, pointing out to him when he was insensitive or when he forgot what it meant to be human: to care about other’s lives. There are many examples of this in Nine’s era, particularly in “Dalek” when she confronted him on becoming just like his enemies because his hatred was driving him to take up a gun and attempt to kill an injured Dalek. In “Rose” she looks at her life and decides to use what she does have (strength, bravery) to save the Doctor. It’s the beginning of the journey Rose takes from seeing her life as inconsequential to seeing it mean something: “But it was, it was a better life. I don’t mean all the traveling and seeing aliens and spaceships and things. That don’t matter. The Doctor showed me a better way of living your life. You know he showed you too. That you don’t just give up. You don’t just let things happen. You make a stand. You say no. You have the guts to do what’s right when everyone else just runs away” (Rose, “Parting of the Ways”). The Doctor says the same of her: “You made me better.” (“Journey’s End”) A better person, a more human individual, someone who could care about the world that had grown bitter in his eyes. She needed the Doctor as much as the Doctor needed her. After “Rose” the Doctor respected her, instead of trying to shove her off, and even though at times later he could get impatient with her, she never gave up on him. She believed in him, while seeing his worst side. She saw his anger, his pain, his vulnerability, and she remained loyal. Rose and the Doctor believed in one another, but more than that, they believed in putting the other before themselves. In a way their love was simple. When she thought she lost him in “Fear Her” her primary concern was, “Who’s going to hold his hand now?” And in “Satan Pit” when everyone thought the Doctor dead, she said, “even if he was, how could I leave him all on his own, all the way down there? No, I’m going to stay.” In Nine’s era (“Aliens of London”), she said, “He’s not my boyfriend, Mickey. He’s better than that. He’s much more important.” Rose put it selflessly in “Doomsday”: “But then I met the Doctor, and all the things I’ve seen him do for me, for you, for all of us. For the whole stupid planet and every planet out there. He does it alone, mum. But not anymore, because now he’s got me.” The Doctor repaid that selflessness in “Journey’s End” when he gave up what he wanted and needed most, her, to give her what she deserved, a life with the him that wasn’t a Time Lord. He gave her himself, without subjecting her to the pain that would happen if she watched herself age and die while he lived on. Their love was simple, pure, and selfless. The Tenth Doctor was Rose’s Doctor, because she was his foundation and his ideal. The Doctor after Rose is less innocent than he was before. He knows things, and he’s felt pain, not just the pain of the Time War, but a pain that is personal by the fact that it happened within his own incarnation and to someone he never loved more. He realizes keenly the consequences to his lifestyle and in a very real sense grows up after losing Rose. He’s more responsible, but grows somewhat reckless with his life, an exaggerated selflessness born out of a subconscious, impulsive desire to end the life that had grown painful because of the loss of Rose. But the Doctor has a responsibility, to live. He tells the Face of Boe (“Gridlock”) that they both have to live precisely because they are the last of their kinds. It’s in honor of his people, to keep their name and heritage alive through the universe, to enable the intelligence and abilities that race allows to help others, to infamously “interfere” with the worlds below that Time Lords thought so abase. This sense of responsibility extends not only to himself but to circumstances and people around him. If a person gets close to him, as a companion or just a team member, he takes it personally if that person is hurt. The way he screams after losing Frank in “Daleks in Manhattan” always strikes me, because Frank is someone the Doctor barely knows, and yet Solomon, Frank’s friend, is more afraid and willing to leave Frank to die to save the rest of them. The Doctor is shocked and clearly unnerved. In “Voyage of the Damned,” he takes the survivors of the Titanic under his wing, specifically one woman whom he makes pointed effort to comfort in the midst of her grief. Related to this sentiment is one of the Tenth Doctor’s common refrains, “I promise.” If he says that to someone, it means the Doctor is putting himself on a contract to do everything in his power to help that person. “Girl in the Fireplace” has him recklessly put aside his own identity and relationships to save the life of a woman who trusts him and who he has promised to help. He tries to reassure Jackie Tyler that he will get them safe in “Doomsday” and gives the same reassuring promise to the people in the starship Titanic, to Donna against the Sontarans, to Jackson Lake and to many others. It’s somehow as if willing himself to another’s protection he guards himself against that impulse in his Time Lord nature to let things go and run away, to stop caring or become indifferent to the plight of life. It’s as if by chalking up a promise to someone, he disciplines himself into becoming more human and even more morally responsible. The Doctor values life. All life, villain and friend alike, or even just creatures just out to survive, inadvertently harming others in its innocent goal. He sees life as incredible, brilliant, and he’s always in awe of the world. He considers the clockwork droids in “Girl in the Fireplace” a work of art, and is amazed at the Midnight creature. He wants to understand a creature before he condemns it, and as often as he can, he gives any villain a choice, one chance to turn from their ways and go free (“Partners in Crime,” “Poison Sky”). The Doctor has killed so often and already has so much blood on his hands that he wants no more, even if he must kill. He’s a pacifist who hates weapons, and takes great pride that his sonic screwdriver “doesn’t kill, doesn’t wound, doesn’t maim” (“Doomsday”). But he has his limits and he will kill if many lives are at stake. “Age of Steel” finds him face a moral choice on the morality of stopping the Cybermen by awakening the humanity inside the metal shells and killing them by the horror of what has happened to them. “Could we do that?” he asks, and Mrs. Moore assures him that yes, they must, or more lives would be killed. The Doctor’s hand kills them, but as he watched them die, he is still aware of what he has done. “I’m sorry.” Those two words that ring sad and heavy throughout his incarnation, for he is never gleeful in the defeat of someone with goodness in him, with humanity in him. If it’s his hand that causes pain or if it’s the circumstances around him, he somehow takes a semblance of responsibility for that, or sympathy for their fate, and tries to comfort them. The Doctor can be very dangerous, because of his abilities and because his emotions are so transparent and intense. His dark side is his righteous anger, intensified by personal loss. After losing Rose, and faced with a villain in the Racnos (“Runaway Bride”), he shows a vengeful side that borders on inhumanity, as he watches with authoritative wrath the children of the Racnos die screaming deaths below. His eyes are fierce and dark, but ultimately very, very sad. Donna shakes him out of the trance, and we see with transparent vulnerability his realization at the cruelty he is capable of. In “Christmas Invasion” we see him strike down a friend, Prime Minister Harriet Jones, because of her betrayal of the peace he justly and fairly forged with the Sycorax. His sentence on her is forged out of anger, but was it just? Fate seems to say no, because ironically, her successor was the Master himself. The Doctor’s a man of no second chances, and that’s proven in “Family of Blood.” He was being merciful to the Family by hiding himself away, to quote Baines. He was enabling them to die a guiltless death, to run the course of their existence without hurting anyone. But when they killed people to find him in the pursuit of his life energy, he gave them what they wanted so much, he made them live forever, in scathing irony to their villainy. It’s the wrath of a Time Lord, as Davros said, the anger and rage of a powerful, sometimes vengefully moral creature like himself. “Waters of Mars” saw him at his worst, when his desire to save lives ran against his responsibility to keep the laws of time, with the fear of his own death (as prophesied in “Planet of the Dead”) casting a heavy shadow on his choice and pushing him to the edge. Like Pompeii, some events in the span of history support the malleable “wibbly wobbly” of time. These are the Fixed Points in Time, the established events, and as a time traveler it was his responsibility to uphold those laws of nature, like the powers that be, the things in life that seem unfair but exist for a greater purpose. Adelaide Brooke was supposed to die, in order to inspire so much good. The Doctor knows that future, he sees the foreordained purpose of her death. But he couldn’t just stand by and let them die, could he? His moral core fought inside him, and in order to justify one wrong (warring against Time) he tried to recast his own vision of himself, that maybe he wasn’t the insignificant survivor of his people, but an all-powerful god who could will Time to his pleasure. But as Mr. Copper of “Voyage of the Damned” so importantly said, “But if you could choose, Doctor, if you decide who lives and who dies, that would make you a monster.” And “no one should have that much power” (Adelaide, “Waters of Mars”). The Laws of Time exist to humble even the most awesome Time Lord, that even someone with so many abilities and intelligence is still responsible to something much larger outside of himself. The Doctor’s actions in “Waters of Mars” came from a burning desire to save life, but significantly, in his time line, also an intense fear of his own death, which as a prophecy meant he could not escape it. On Mars he tested how much power he had over Time, so he could stop the prophecy and continue living. This was a direct commentary on not only the dark and selfish possibilities of himself, but of his species, who were willing to end Time, defy a prophecy foretelling their destruction, and kill every life alive in order to survive. The Doctor learned from Mars, and he recognized that he went too far. By “End of Time,” he admitted that sometimes death saves one from becoming evil, especially to a Time Lord as fallible as him. The Doctor holds himself to a high moral standard, one intensified by circumstances, the epic scale of his choices, his own Time Lord nature, the natural authority he holds himself to. But it’s not unlike a statement from the man who plays the Doctor: “I’m a good person, I hope. But I’m never as good as I want to be, never as nice as I want to be, never as generous as I want to be” (David Tennant). He’s tempted to relish in danger (“Tooth and Claw”, “Planet of the Dead,” and as Donna points out to him in “Runaway Bride”), to reach for more power than what is good for him, mostly to enable him to help others (“Waters of Mars,” “School Reunion”). He’s a genius and he throws that idea around, and yet his core is very humble, very human. Humility’s a complex subject and one with many facets. It’s not the denial of one’s abilities but an honest admittance to the limitations of one’s talents and intelligence. Arrogance has a person believe too much about himself, while humility is honest. Humility is not demanding a reward for action, but giving credit where credit is due. It’s not putting one’s own life above another’s, it’s not putting one’s own impulses and pleasures above the needs and happiness of others. It’s about believing in a principle over a pleasure, it’s about knowing where one’s limits are in the world and keeping them. Humility is about learning from others, it’s about admitting to one’s faults and trying to be a better person. It’s about not abusing one’s power, but rather, raising others up and seeing past oneself to the wonder and importance of things beyond you. The Doctor has all these and more. Yet the Doctor’s humility is in some ways, unquantifiable. One sees it in his lifestyle. The constant refrain in his life is giving, giving up his home, his happiness, his love, and ultimately his life for the better of others and the world. He gives up Rose, the love of his life, to an unreachable world where he knows she would be happier. He lets his friends go to better lives, lives apart from him, because he knows that ultimately, he scars them and they are better without him. At the end of his life, he made his very last acts towards them ones of giving: he saved Mickey and Martha’s life, he saved the life of Sarah Jane’s son, he gave lonely Jack a friend, he gave Sylvia a message from her late husband, he gave Donna a comfortable financial future, he asked if Joan Redford lived a happy life. He gives up his innocence for the better of the world — the Time War and Pompeii. He would and did become the guilty one in order to save the universe. He’s willing to do something that would harm him emotionally or physically for others’ benefit. 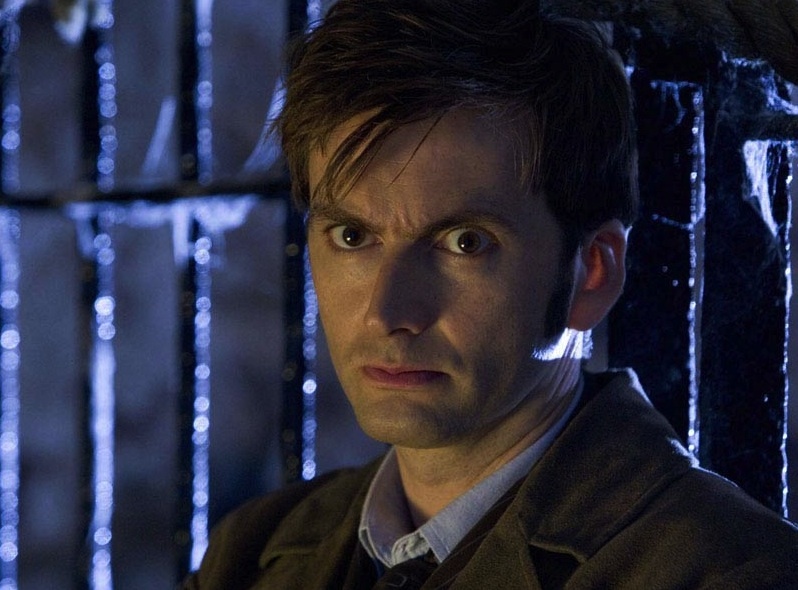 “Smith and Jones,” “Evolution of the Daleks,” “Family of Blood,” “Fires of Pompeii,” “Poison Sky,” “End of Time” all find him willing to lose his life to protect the innocent. He always learns from his companions, because he knows he needs them to be a better person. He takes companions to stop himself from what he’s capable of (“Fires of Pompeii”), and yet he’s grown keenly aware how by taking companions he’s absorbing their lives into his own and that somehow he’s going to ruin them in the end. Martha told him how he was at fault for what happened to her family (“Sound of Drums”), Sylvia Noble made it very clear to him how he ruined Donna Noble (“Journey’s End”), Davros twisted the knife in his soul by showing him how so many have died for him (“Journey’s End”). Each time he accepted those accusations, even if some of them were unfair, because at his heart he knows that he’s not perfect. He’s chasing redemption, and yet he allows himself no mercy when he falls short of his moral ideal. The weight of all he’s seen and all he’s killed is never washed by the goodness he creates and the love he’s forged. He puts aside hatred and revenge to uphold mercy and forgiveness. To the man who killed his daughter, to the last Dalek of the race who killed his people and made him lose his Rose, to the Master, to his metacrisis, to the Sontarans. In “Waters of Mars” we saw how much his own life meant to him, that he would kill and try to overstep his bounds to stop the prophecy of his death. When one more life chose to die to do the thing he should have done, he realized how far he’d gone, and he humbled himself to the point that he would have the Master kill him to fulfill fate. He knew what his people had become, willing to erase Time itself to save their own lives, and in “Waters of Mars” he saw himself going that path. His conclusion? “Sometimes a Time Lord lives too long” (“End of Time”). But even at the close of “End of Time” destiny still demanded more of him. He’d defeated the Time Lords, set the world right again, but would he be willing to die for the life of someone else? Would he be willing not simply to risk his life, not simply to be killed, but to lose not only his life, but his identity, and then not by someone else, but by his own hand? The Doctor had always pushed himself to a higher moral ground than most people, and most heroes, but this choice demanded so much from his already crippled, broken heart that it seemed fate would have deemed that he had suffered enough. Wilf was just an old man, so soon to die anyway, and “I could do so much more” — with his abilities and his intelligence, the world could be saved over and over if the Doctor just kept living. His greatest desire is to save lives, was that not worth something? Was that not worth more than this old man’s life? That small life with no credentials or importance in the objective scope of things? But the Doctor can’t just walk away from Wilf, and that fight to save a life is more him than his life ever was. “It’s my honor.” There is no bitterness against Wilf, because despite all the things the Doctor knows he is, the Doctor knows he is no better than anyone else. “We must looks like insects to you,” says Wilf. But no, “I think you look like giants,” the Doctor replies (“End of Time”). That’s the core and depth of the Doctor’s humility, that he does know how incredible he is and how important he is to the world, how smart he is, how powerful he is. He loves who he is, he is excited and thrilled by how brilliant he is, but he doesn’t demand an audience, never asks to be thanked, and most of all, never puts his own life and happiness ahead of someone else’s. The Doctor grew from rejecting anyone in his life (“Rose”) to admitting tearfully that he desperately needed someone to keep him from the demons in his soul (“End of Time”). He went from a playful adventurer gallivanting the world with the love of his life to a man plagued with loss and guilt, and yet capable still of hope, optimism, heroism and most of all, love. He’s a hero who gives the best of himself to others, and asks for nothing in return.